Love the blog; thought I would chip in on the current run of articles about rackmounting PCs. I have just done the same thing after many weeks of research. Like most people looking at this, my budget cannot stretch to a laptop at the moment, so rackmounting my current PC ([AMD] Operton 165) seemed like a cheaper idea. 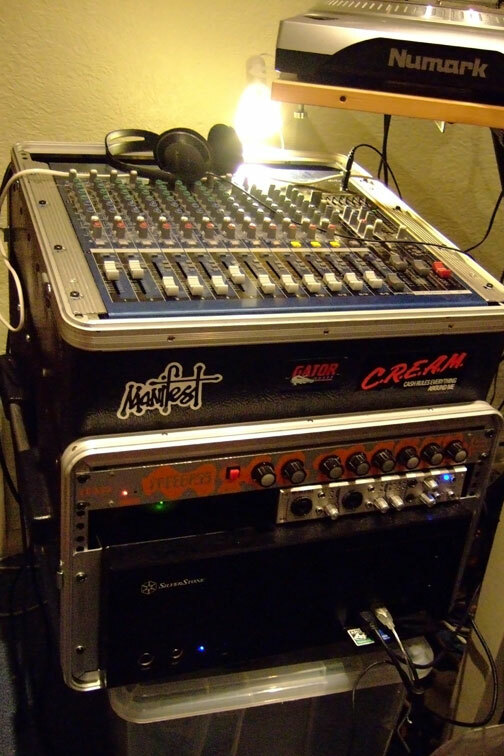 I also needed to mount up my mixer as the idea is to live live with my band and be able to mix vocals/instruments through the computer as well as turntables, etc. They do come in smaller sizes if you only wanted to have the PC, but I figured that a few extra rack spaces would come in handy. The main problem with flight casing PCs is the dimensions; rackmount cases tend to be server cases, and as a result are very long, a lot long than most standard rackmount equipment. After many weeks of searching I came across this case, designed as a HTPC case but this is a bonus, as it means it is quiet and about the same dimensions as a HiFi amp, so fits the Gator perfectly. The only problem I have had is that the rackmount ears for the LC17 are not actually out yet. My solution was to bribe a retailer into selling me a pair of the rackmount ears for the LC18. I had to drill them to get them to fit as they are a different shape. This should not be a problem by the end of the month, though, as Silverstone will be releasing the proper rackmount kit. The case is beautiful, has well-designed cooling zones, is quiet, and will take a full ATX motherboard. All in all, the Gator case was Ãƒâ€šÃ‚Â£75 from eBay, the case around Ãƒâ€šÃ‚Â£65, and I’m real happy with the set up. It’s a bit heavy, but nothing in the laptop world can touch it! Thanks, Nat! Your whole note was useful, so worth reprinting in its entirety. If anyone else has rack rigs they’d like to share, send ’em on in! And in the meantime, have a listen to 601: quite nice music!